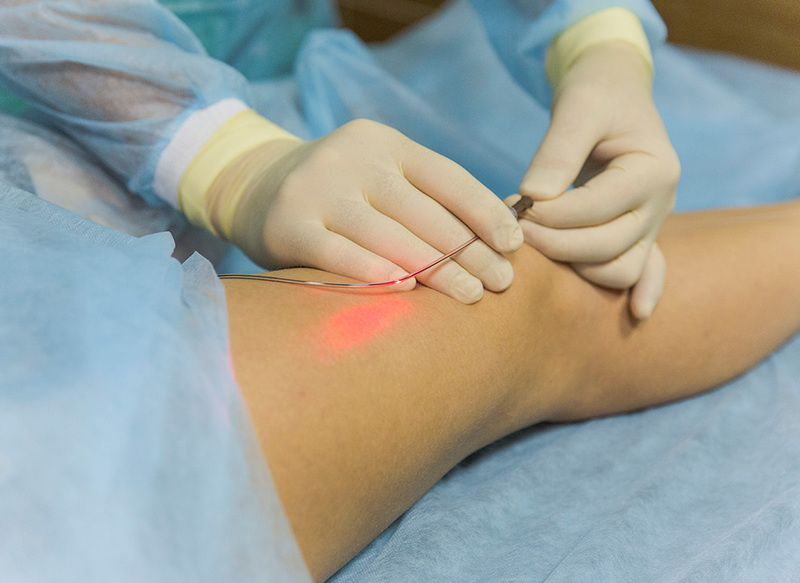 If you’re reading this, the chances are good that you and your vascular surgeon have decided that Endovenous Laser Therapy (EVLT), is the right approach for treating your varicose veins. The laser therapy procedure is faster than traditional surgery, there’s less pain and bruising and the recovery period is much quicker. Furthermore, there’s much less risk of the varicose vein ever reappearing after laser therapy than through traditional surgery. This newer treatment option is successful an estimated 93 percent of the time, which is a higher rate of success than other treatment options. Now that you’ve made the decision, here’s what you can expect to experience on the day of your visit and as you recover afterwards. Traditional surgery involves the “stripping” or surgical removal of the vein. The patient must undergo a cut at the groin under general anaesthesia. Laser treatment works in a much different way. You’ll be given a local anaesthetic, which will numb the treatment area. This anaesthesia will be administered with a very thin needle injection in your thigh. It will numb the treatment area so you’ll feel very little pain or discomfort, but you’ll remain awake and alert. Then only very tiny cuts will be made in the leg, through which a very fine tube or catheter will be inserted. Through this catheter a light fibre will be directed into the vein you want removed. The heat energy from this laser beam will shrivel up the vein and eliminate it. In some cases, your treatment could also include a procedure to physically remove smaller veins after the laser treatment. This involves receiving cuts so small they will be covered up afterwards with adhesive strips. This secondary procedure is called avulsion. If it’s to be part of your treatment plan, your doctor will have explained that to you. Because it’s such a relatively fast, simple and safe procedure, your laser treatment will take place in an outpatient facility. The total time, including the recovery period at the facility, will only be a few hours. In general, the procedure itself will take only a half hour to an hour per leg. There’s no need to fast or to otherwise prepare for your laser treatment. Simply arrive at your scheduled time with slippers and a bathrobe or sleeping gown. When you are asked to walk after the treatment you’ll wear your robe or gown over the theatre gown that you will have changed into before the procedure. After going through last-minute consultations with your medical team, you’ll be asked to sign a consent form. Then the laser treatment will begin. When it’s completed,compression pads will be placed over the cuts and a tightly fitting compression stocking will be applied to cover the whole leg or legs. If you’ve had avulsions as part of your treatment, you’ll first be given a compression bandage which must be replaced at a separate appointment with your nurse. After the bandage has been removed, you’ll be given your compression stockings. When your medical team is convinced that the procedure went smoothly, you’ll be allowed to go home. This entire process should not take more than a few hours. There could be some pain or discomfort after the procedure, but it should be easily controlled with the recommended dosage of a mild painkiller such as paracetamol. Skip baths and showers. This is the part of the after-care plan you’ll hate the most. A sponge bath is all right, but avoid getting your treated leg or legs and compression stockings wet until you are allowed to remove them. This will generally be in 7 to 14 days. Control minor bleeding if it occurs. You might experience a very small amount of bleeding at one or more of your treatment locations the day of the treatment. This is not anything that should worry you. Simply elevate the leg and apply pressure to the area over the top of the compression stocking. The bleeding should stop in a few minutes. Wear your compression stockings 24/7 at first. You must keep your compression stockings on day and night for the first week or two. After then, you must still wear the stockings during the daylight hours for the next five weeks. But you can take them off at night or to hand wash the stockings. Walk regularly. This is particularly important to the success of your laser treatment. Try to carve out enough time in your day for at least three 20-minute walks. Don’t drive for two weeks after the procedure. Don’t fly. It’s advisable to avoid air travel for about six weeks after your laser treatment. You will be given a phone number to call if you experience serious complications, though this is very rare. Complications could include chronic bleeding or pain in the leg that can’t be controlled by taking a mild painkiller such as paracetamol. Very rare complications can include infection in the leg or the onset of deep vein thrombosis, or DVT. If problems such as this occur, or the pain or discomfort persists, be sure to call your physician. Likelier, and less severe, complications can include minor pain or discomfort, bruising, reddening or a pins-and-needles tingling sensation in the affected areas. This should go away in a couple of days, but some of this discomfort or discoloration could last as long as two weeks or even longer. You will have a follow-up appointment with your physician about six weeks after your treatment to go over the results.